Dr. Donald B. Johnson grew up in Iowa City, Iowa. He graduated from the University of Iowa with a degree in Political Science. After undergraduate training he was commissioned in the Unites States Navy and served one tour in Vietnam. He received his medical degree at the University of Iowa and interned at the Marshfield Clinic in Marshfield, WI. He completed his dermatology residency at the University of Iowa, and then completed a fellowship in Dermatologic Surgery focusing on Mohs microscopic surgery for skin cancer. 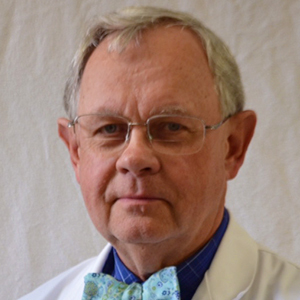 Dr. Johnson established his practice in Cedar Rapids, Donald B. Johnson, MD, PC in 1980. He retired from that practice in 2010. He rejoined the practice of Dermatology Clinic Of Iowa PC in September of 2016. He is board certified by the American Board of Dermatology and is a fellow of the American College of Mohs Surgery. He specializes in Mohs Micrographic surgery for skin cancers and treating diseases of the skin.